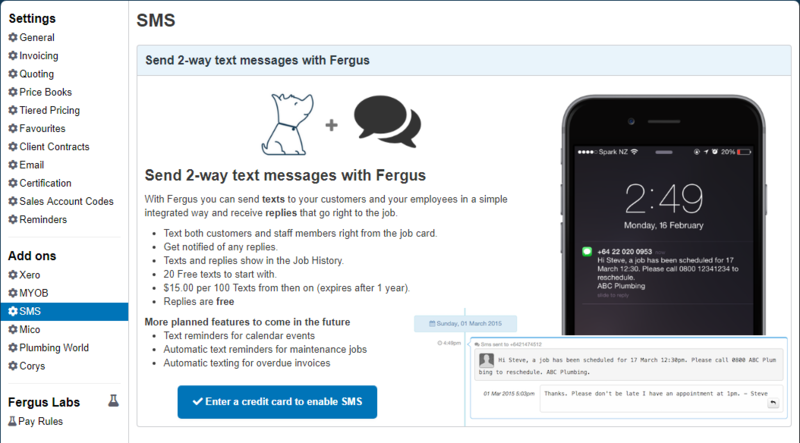 Enable our handy SMS integration to start sending SMS messages from within Fergus. We'll get you started with 20 free text messages to try out the service, and from then on you can buy more messages in bundles of 100. Replies that your customers send you are free. Every reply will send you a notification in your Notifications screen. Messages relating to a job will also appear in that job's Notes & History. Because messages come from a number assigned by our SMS provider, we can't guarantee what number messages will be sent from, so we recommend that you include your company name in any messages sent. Our SMS templates include your company name by default. This also means we cannot guarantee SMS replies will be received after 48hrs as the shared number is re-used by our SMS provider. SMS is currently available in New Zealand, Australia, Canada, and the UK.